Much-loved and followed SA blogger Tandy of Lavender and Lime blogs for TASTE! Read her yummy post on lamb burgers. 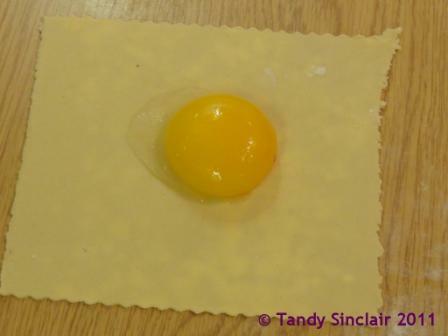 In celebration of this lovely accolade, I decided to devise a recipe for duck egg ravioli to showcase duck eggs. This is a new product on the shelves at Woolworths, and I have been buying 6 a week since I first saw them. Duck eggs have the most amazing yellow yolk – and it is large. They make the creamiest scrambled eggs you can imagine and so far I have used them to make mayonnaise and cookie dough. Duck eggs are now available locally at selected Woolworths stores so if you find them, do buy them! you will notice, these are not the same shape as in the photograph of the meal. The first time did not work out properly, so I did them again. 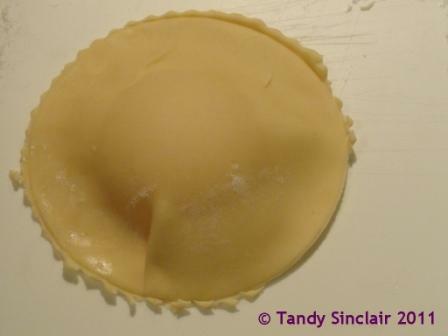 This shape meant less pasta, and the thinness of the pasta meant a better texture. The cold egg yolks meant they were nice and soft when they were opened. you need to get all the air out and not break the yolk! 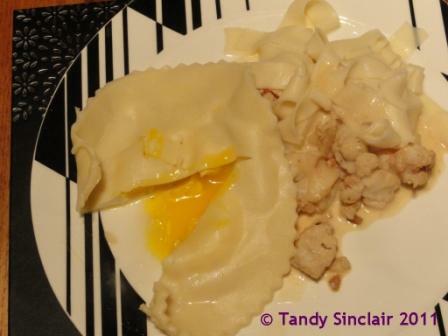 I am submitting this recipe to Presto Pasta Nights, which is being hosted next week by ME! Great that you have been feautured in such a fine foodie mag, Tandy!! What a great iedea with raviolli! Congrats on being featured – how wonderful! And I love this recipe -I could do this with our eggs if only my hens would get on and start laying a few more! I’ve never used duck eggs before. It’s not something that I often see about. Tandy, I am so impressed. This is a dish that I have only seen in restaurants. From what I understand, it is very hard to get it cooked perfectly and you did it. Congratulations! Wow, is that ever lovely? I have never heard of an egg ravioli but I would love it. Kudos on a beautiful post. The title alone has me drooling! Homemade pasta is well worth the extra time and effort. Yours looks fantastic! Again – congrats on being featured on Taste! Yummy…Could I get a few link sausages, grits and toast with that? And for dinner,maybe the duck that laid them? Looks great, thanks. I am not sure about the duck …. 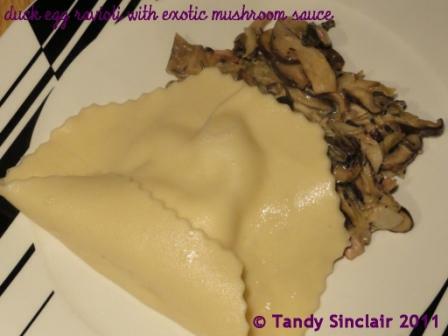 Your ravioli and mushrooms are absolute taste-explosions! Very professionally done. Congrats on the Taste mention, I need to grab your autograph before you get too famous 🙂 Friday greets to Dave.